If that seems silly to you, then I'll explain. I have always shared a bathroom. Growing up it was 1 bathroom with just a shower for 6 people. It had two doors, neither of which locked. It sucked. Then I shared a bathroom with my grandparents, then roommates and then with Kevin. Sharing a bathroom with Kevin is totally fine, we just learned to not brush our teeth at the same time! This apartment has TWO bathrooms. And I immediately claimed the master bedroom one for myself! We decided to stick with the grey and black theme of our towels, because they are good quality and I don't want to replace them. We found two bath mats and a shower curtain in the perfect colors at target, as well as the soap and tooth-brush holder and mirror. The best part about having a bathroom to myself, is the ability to spread out all my stuff. I have yet to figure out a good way to organize under the sink, which is why it's not pictured. I am thinking I need to get some mini shelves to put under there. But it's fully of hair and nail supplies! After we got the basics for the bathroom, I started looking for things for the wall and found this little unit. It is perfect for storing my palettes and favorite makeup. Next I found a basket for all the items I have to hand wash. I hate hand washing, but some things you just have to do. It's super nice having a tub to wash them in and a place to toss them when dirty. Lastly I found these adorable picture frames. Hopefully they will do well with steam. But I love what they say and though I would have preferred the "u's" to have been silver, I think the gold works well and adds a little something. I am super happy with how it's turned out. And now if you have a moment, I have questions! The bathroom needs a plant... what kind of plant do you put in a bathroom?? 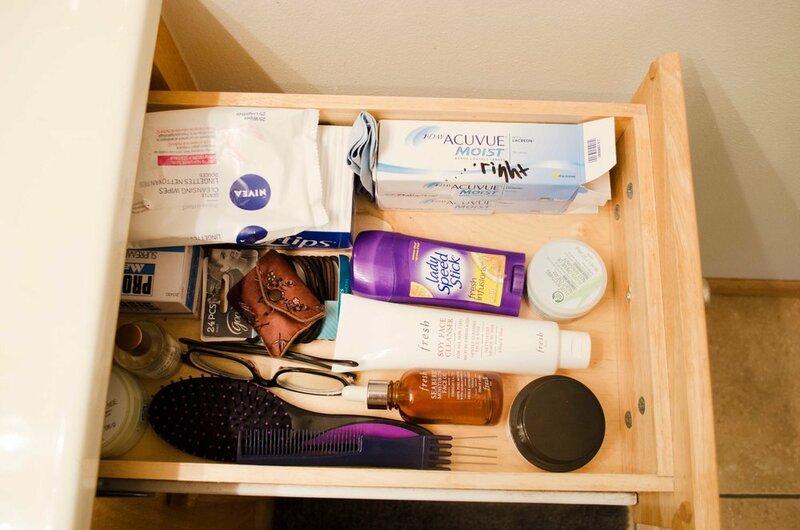 How do you organized under the sink?